As I was preparing to hard boil a few eggs for Easter, I could hear in my head the voices of a few people in my life who hold strong opinions on the best way to complete this particular process. This is certainly not the first time I’ve ever mastered the art of boiling eggs, but just for kicks, as I was letting the eggs warm up to room temperature (another “must do” tip I’d heard somewhere along the way), I went to the Resource-That-Knows-All, the Internet. One quick search of “how to hard boil eggs” brought a myriad of rules to follow for the “perfect” hard boiled egg. I was amused to see how a “recipe” which requires literally two ingredients – water and eggs – could vary so much. Each source proclaimed theirs was the best way to achieve perfection: Put enough water in the pot to barely cover the eggs; bring the water level to 4 inches above the eggs; bring the eggs to a boil then turn off the heat immediately; bring the eggs to a boil, turn off the heat, then turn it back on; let the water boil for 1 minute; let the water boil for 30 minutes; add salt; add vinegar; let the eggs sit in the hot water for 12 minutes; remove the eggs from the hot water immediately; rinse the eggs in a colander; put the eggs in ice water for 10 minutes… and on it went. 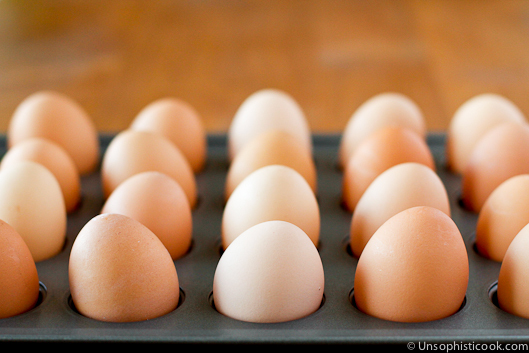 Each technique proclaimed certain benefits: less cracking; easier peeling; firmer eggs; freshest taste. Somewhere along the way, Our Way becomes the Right Way and we get downright stubborn about making any changes. There are specific ways we’ll make things like meatloaf (with ketchup on top? ), mashed potatoes (creamy or thick? ), grilled cheese sandwiches (butter before grilling? ), tuna salad (with celery and mayonnaise? ), beef stew (big carrots or small? ), deviled eggs (with olives or paprika?)…. And we can get into lengthy discussions with family, friends or co-workers about the “best way” to create a certain successful dish. One challenge that presents itself is when we get married, or live with a partner or roommate, and suddenly there are two “right ways” facing off in the same kitchen. I believe men are especially attached to how things “should taste”, usually based on their childhoods or a previous relationship. We are then tasked with either trying to convert them to “our way”, or feel pressured to make it “just like mom used to.” I felt like I had successfully climbed Mt. Everest for my husband when I mastered making Italian Wedding Soup like “Ma Pucino” and Corned Beef and Cabbage “just like Teeter’s.” Yet I have successfully converted both my husband and son to “my” mashed potatoes and meatballs. Cooking is both a personal, and a social, activity. We R.W.’s view it as a reflection of ourselves – on our tastes, our styles, our capabilities, even our personalities. We certainly have all experienced failures in the kitchen, and once we have recovered from the horror, they become the stuff of legends and future party stories. We also have our own “signature dishes” which we proudly present at every opportunity, just waiting for the chorus of “ooh’s”, “aahh’s” and “yums” they evoke. Even when it comes to the basics – say, boiling eggs – we follow our own “best practices”. And although it is far from rocket science, we are still proud when we reach perfection. Or, at least, good results. We feel it is then our mission as R.W.’s to pass along our Tried-and-True Right Way to the next generation. Sure, they may not adopt it… but we are at least assured of a topic to be discussed over dinner at the next holiday gathering. This entry was posted in family, Food, Holidays and tagged best practices, cooking, eggs, generations, recipes, tradition. Bookmark the permalink.